An image of an impossibly thin Ralph Lauren model has stirred quite the brouhaha in the blogosphere. A new ad shows the model Filippa Hamilton sporting the designer's latest ensemble, but, through photo-editing, her waist has been whittled down to appear smaller than her head. In late September, the blog Photoshop Disasters posted the ad, as did the blog Boing Boing, adding the caption: "Dude, her head's bigger than her pelvis." Ralph Lauren didn't take too kindly to the online attention and, last week, sent out copyright infringement notifications in response to the critical blog posts. In a letter dated Oct. 6, PRL USA Holdings, Inc. (Ralph Lauren) informed Boing Boing that the Web site did not have authorization to post the ad and asked that the site remove the image. Google's Blogger, the blogging platform that hosts Photoshop Disasters, was also served with the notification and removed the image. But Boing Boing refused. c) Offer nourishing soup and sandwiches to your models." In a statement, Ralph Lauren acknowledged that the image had been doctored. "For over 42 years we have built a brand based on quality and integrity. After further investigation, we have learned that we are responsible for the poor imaging and retouching that resulted in a very distorted image of a woman's body. We have addressed the problem and going forward will take every precaution to ensure that the caliber of our artwork represents our brand appropriately," according to the statement. 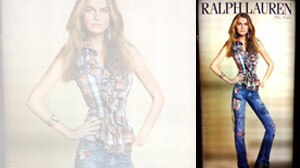 Ralph Lauren's digitally altered ad is just one of many manipulated photographs to court controversy. Here are 10 others. In August, the blogosphere went wild over an image in a Microsoft Corp. ad that had been edited to change a man's race from black to white. In a photo featured on the company's U.S. Web site, three colleagues -- one white, one black and one Asian -- sit around a conference room table. But in the same photo on the company's Polish site, the face of the black man had been replaced with the face of a white man. The gaffe sparked quite the discussion online, as bloggers and commenters wondered if the change was racially motivated, the result of poor judgement or both. Some people suspected that the computer technology giant changed the Polish image so that it matched the country's own racial composition. It even inspired the popular tech blog TechCrunch to launch a contest to see who can manipulate the funniest head onto the Microsoft ad. "So get Photoshop fired up and make your funniest (and yet not in any way offensive) version of the Polish Microsoft head replacement. No rules. Replace all the heads if you want to. Add costumes and props. And text bubbles," it said on its site. The winner gets a Bing (Microsoft's search engine) T-shirt in the mail. Ultimately, the affair elicited an apology from Microsoft, which said in a statement, "We are looking into the details of this situation. We apologize and have replaced the image with the original photograph." Earlier this summer, officials in Toronto had to defend their own decision to decieve its audience when it was learned that they had superimposed the face of a black man over that of a white man to make a recreation brochure look more inclusive. A spokesman for the department responsible for the summer "Fun Guide" told the city's National Post newspaper in June that the alteration was consistent with the city's policy to reflect diversity. "He superimposed the African-Canadian person onto the family cluster in the original photo. It was two photographs and one head was superimposed over the original family photo," said John Gosgnach, communications director for the social development division. "The goal was to depict the diversity of Toronto and its residents." But, apparently, the diversity didn't pass the authenticity test for a graphics editor at the National Post. A program called TinEye that detects digital manipulation confirmed that it had been altered. Jim Edwards, former managing editor for AdWeek and BNET.com columnist, said this example is not the only one of its kind. "It's not frequent, but one or two crop up each year, particularly in the advertising business," he said. In advertising, there are no ethical restrictions when it comes to digital manipulation. But when those manipulations draw attention to race, the brand could find itself in trouble. "It's the one thing you absolutely don't want to do," he said. But race-altering edits have backfired for other brands too. 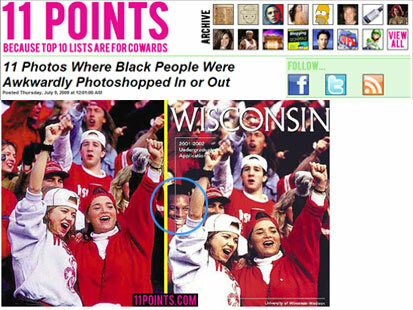 In 2000, the University of Wisconsin admitted that it had doctored the cover of a brochure to make the school look more diverse. Into an image of mostly white students cheering at a football game, it digitally inserted the face of a black student, Diallo Shabazz. Jet magazine quoted Shabazz as saying that he had never attended a football game at the university. According to the National Press Photographers Association, the university reprinted all 106,000 copies of the brochure after it was caught. In marketing and advertising, where most images are air-brushed and altered, such manipulations may hurt a company's image but they aren't considered ethical breaches. In news, however, it's an entirely different story. "For news, it's just, you don't do it," said John Long, former president of the National Press Photographers Association and now the group's ethics chairman. "It has to be that simple. It comes down to it's just not right to lie to the public." He said each time a news organization is caught manipulating images, it decreases the credibility of the entire industry in the eyes of the public. One of the first examples to raise the issue, he said, was Time magazine's decision to darken the color of O.J. Simpson's skin on the cover of its June 1994 issue. The magazine took the mug shot of Simpson when he was arrested and tweaked it before putting it on the cover. It was caught because Newsweek published an unadulterated version of the photo around the same time. "O.J. was interesting because it was one that caught everyone's attention, he said. "It was the beginning of the public discussion." In an editorial piece the week after the controversial issue was published, Time's managing editor wrote, "The harshness of the mug shot -- the merciless bright light, the stubble on Simpson's face, the cold specificity of the picture -- had been subtly smoothed and shaped into an icon of tragedy." But to the National Press Photographers Association, those alterations changed the image from a document of reality to an editorial statement that deceived the public. Another ethically-questionable image was featured on the cover of an August 1989 TV Guide. The picture combined the head of Oprah Winfrey and the body of actress Ann-Margret, taken from a 1979 photograph. The photograph was created without the permission of Winfrey or Ann-Margret and was detected when Ann-Margret's fashion designer recognized the dress, according to Hany Farid, a professor of computer science at Dartmouth College who studies imagery manipulation. In another controversial magazine cover image, Martha Stewart's head was placed on top of the body of a slimmer model who had been photographed separately in a studio. In 2005, Newsweek magazine placed the image on the cover of its magazine after Stewart was released from prison, ostensibly to highlight the many pounds she had shed. The decision drew criticism from the industry with the National Press Photographers Association, calling it a "major ethical breach." "NPPA finds it a total breach of ethics and completely misleading to the public," association president Bob Gould said in a statement at the time. "The magazine's claim that 'there was a mention on Page 3 that it was an illustration' is not a fair disclosure. The average reader isn't going to know that it isn't Martha Stewart's body in the photograph. The public often distrusts the media and this just gives them one more reason. This type of practice erodes the credibility of all journalism, not just one publication." 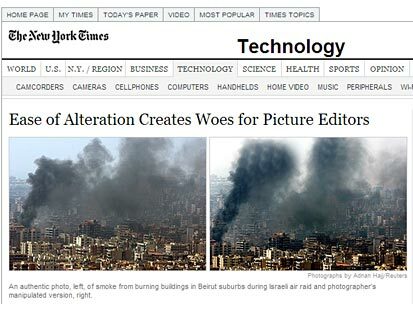 In 2006, Reuters was forced to fire a photographer, remove images from circulation and change policy after finding that a photo of an Israeli air raid on Beirut had been manipulated. Bloggers were the first to notice that the clouds in an image taken by Adnan Hajj, a Lebanese photographer, had been darkened. Soon after, Reuters issued an apology and said it withdrew from its database all of the images taken by Hajj. "There is no graver breach of Reuters standards for our photographers than the deliberate manipulation of an image," Tom Szlukovenyi, Reuters Global Picture Editor, said at the time. "Reuters has zero-tolerance for any doctoring of pictures and constantly reminds its photographers, both staff and freelance, of this strict and unalterable policy." In June 2008, a number of news outlets, including the Los Angeles Times, BBC News and the New York Times, unknowingly ran an image of Iran's missile tests that included one missile too many. An image showing four missiles was distributed by Agence France-Presse (AFP), which said that it received the image from the Web site of the Iranian Revolutionary Guard's media division. Later, however, The Associated Press distributed a similar image that included only three missiles. The AFP retracted its version of the photo, saying that it had been "apparently digitally altered" by Iranian state media. In August 2006, the Associated Press had to pull a photo when an editor added an extra set of hands on an Alaskan oil pipeline worker. 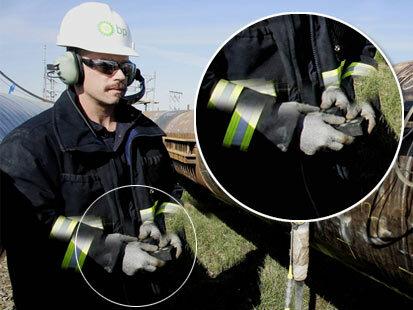 The photo captured a BP employee scanning a section of pipeline that had leaked 200,000 gallons of oil earlier that year. An editing error apparently gave the worker four hands instead of two. 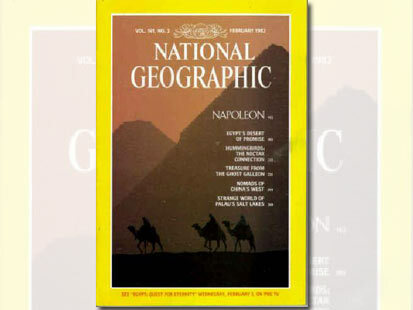 In one of the most well-known and earliest examples of photo manipulation, National Geographic moved the pyramids in Egypt to make a vertical cover out of a horizontal photograph. According to the National Press Photographers Association, the magazine referred to the change as the "retroactive repositioning of the photographer," explaining that had the photographer been in a slightly different position, he would have been able to capture the image naturally. But to photojournalism ethicists, it still constituted a lie that damaged the magazine's credibility, as well of that of the entire news business. As technology has changed what photo editors can do to images, it's also changed the way the public perceives them, Long of the National Press Photographers Association said. "People don't look at pictures as though they were historical documents but as things that they want them to be," he said. "It's so easy, it's so pervasive, that the nature of photography has become liquid. And that is a very big threat to what we do in the news business, which is to try to document reality in pictures that are accurate. Once the accuracy goes, we have nothing left to offer."